A study was released last year that found nurses are 23% more likely to take their own lives than the general population. Adding to that shocking statistic is that nurses are 4 times more likely to commit suicide than people working outside of the medical field. This is all so tragic and sad. Nurses have access to lethal medications, which makes it easier for them to act on their self-destructive thoughts. 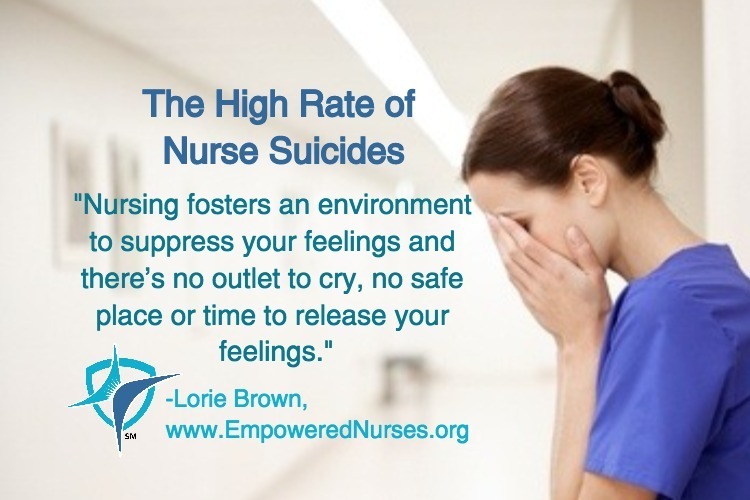 I am always saddened when a nurse comes to me who has contemplated suicide. I always do what I can to be sure to get them the care that they need. Nurses are stuck in the middle of taking care of the demands of the patients as well as the demands of the system. It is difficult to cope with everything a nurse might see, even in a typical workday. If anything distresses a nurse, there is virtually no outlet for that pressure. They can’t even talk about this with a loved one at home because of the HIPAA restrictions. Who is there to take of the nurse? Nurses feel pressure being the central spoke of the health care team and coordinating all the other medical care that a patient needs. Nursing fosters an environment to suppress your feelings and there’s no outlet to cry, no safe place or time to release your feelings. We tend to build a wall to insulate ourselves from getting hurt that also keeps us from reacting to what is going on about us in health care facilities. If you know a nurse who appears depressed or perhaps even seems to be contemplating suicide, please get them the help that they need. There is the National Suicide Hotline at 1-800-273-TALK (8255) that can assist or, if the matter is urgent, call 911 immediately to speak with a trained counselor on a crisis hotline. Both in law and medicine, at least in Indiana, there is a peer assistance-monitoring program, which helps physicians and attorneys with both substance abuse and mental health issues. But for nurses, most peer assistance programs only deal with substance abuse. There is no recognized program to help with mental health issues. Employee Assistance Programs (EAP) are available through some employers. Although I know many nurses feel uncomfortable contacting EAP for fear that their employer will find out, there are strict confidentiality guidelines in place so what you share with EAP will not be disclosed to your employer. I would like to see additional resources to provide nurses with the support and the help that they need. What do you do to release feelings, so you can deal with the pressures from work? What does your facility do? Let me hear your comments below.